Built on a foundation of over 40 years of consulting activities, the Graduate School Roberto Miranda Corporate Education had its DNA shaped by customer demand for effective results in behavior, technical skills and talents of their teams. While traditional schools were paid for their certificates, Roberto Miranda was sued to deliver content capable of promoting significant changes in many different global corporations. This movement, over the years, honed a school full of effective learning systems able to bring about real change in the life and success of the students and the companies where they work. 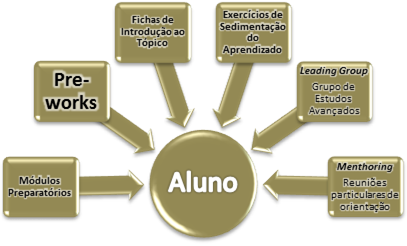 To ensure that the contents of the programs offered can only deal with issues and advanced topics, the School offers preparatory modules for entry into key disciplines, so that there is a prior equalization of knowledge among students in class. The preparatory modules can be eliminated by those who demonstrate a minimum level of knowledge required for entry in each discipline through tests online or in-person. For some classes is required prior to completion of works that help to align the issues to be addressed, benefiting the learning process. Each class is an introduction to learning record that is available in the virtual environment and can be downloaded directly to your Ipad students. The chip, also called the introduction to the topic form, aims to instruct students on what are the issues to be addressed in class (inputs), which recommended bibliography, which the purpose of the school to teach this matter and what expects the student after class (outputs). To ensure that what was given in the room is sedimented as effective learning, teachers prepare unique exercises for the MBA School, involving from research, to the development of a Business Plan. The Leading Group is the group of advanced studies of Roberto Miranda Corporate Education. taught modules exclusively in a foreign language on current affairs of the world market. This group is accessible to all students and work under mentorship of international teachers. Videos, audio podcasts and other activities available on the site are the basis for roundtables groups formed by students is interested to go beyond. Students have at their disposal, mentors who provide guidance for business, life and career. Meetings by appointment and exclusive attention to your success.